"[T]oday, a nail-making machine with a footprint of about three feet square [can] produce 300 to 450 nails per minute. If we assume that one worker can operate 4 machines at once and that each machine produces 350 nails a minute, then labor productivity of nail production has increased by a factor of 1400 times since the era of hand-forged nails when it took a worker about a minute to produce a nail. With most of this change occurring over the period from 1790 to 1940, the annual rate of increase in labor productivity was nearly 5 percent a year ..."
"[T]he dome of the Maryland State Capitol, completed in 1788 and made largely of wood, was joined together with no nails but rather with wooden pegs and iron straps. Presumably, this choice was made, at least in part, because of the high cost and limited availability of nails at the time." 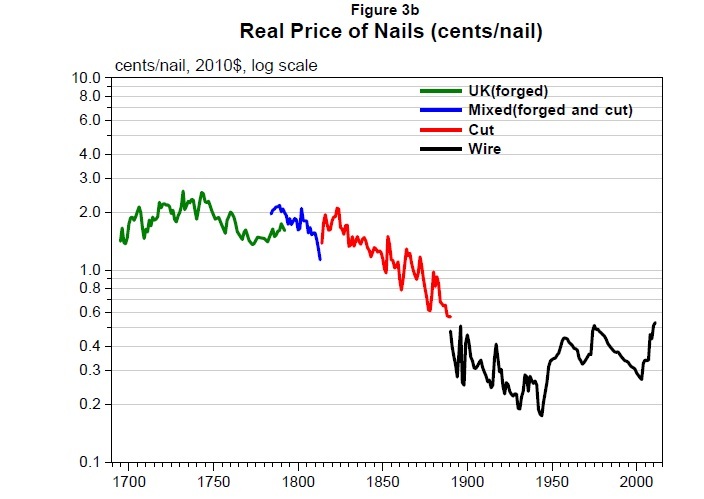 "The high value of nails during the 1700s is highlighted by the practice of burning down abandoned buildings to facilitate recovery of the nails ..."
"[T]his paper also reports domestic absorption of nails, going back to 1810. At that time—more than 20 years after the Maryland State Capitol was completed—nails are estimated to have amounted to about 0.4 percent of nominal GNP. In today’s terms, this share is similar to that of household purchases of personal computers and peripherals or of airfares. As prices plunged during the 1800s, domestic absorption rose dramatically. But, as a share of nominal GDP, domestic absorption of nails, which once were quite important, have become de minimus. 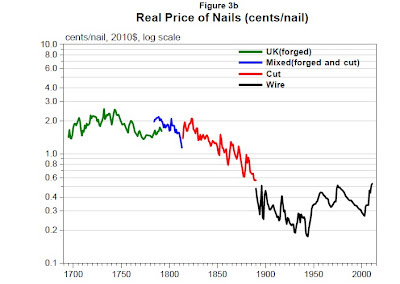 So, while nails appear everyday today, that perception reflects a couple hundred years of significant declines in their relative price." "In 1798, a relatively simple house (24’ x 36’ with 7 windows) in Warren, Connecticut was valued at $50. ... This house likely was built with few nails, but, as a thought experiment, let’s suppose that it were built primarily with nails rather than other joinery. ... Suppose that the 1798 house would have required 50 pounds of nails ... Given nail prices in 1789 of $12.00 per hundred pounds, the nails for that 1798 house would have cost $6.00, more than 10 percent of the value of the house!" While the price of nails themselves hasn't fallen in the last half-century, Sichel makes several interesting points. First, the variety of nails has risen and there have been a number of quality improvements, like rust-proofing nails and adding rings around the shank of the nail to improve holding power. In addition, Sichel argues that the invention of the nail-gun has caused the price of an installed nail to continue falling substantially. 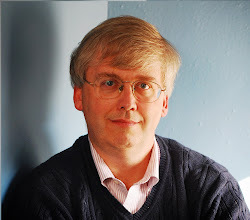 He uses back-of-the-envelope calculations to suggest that the price of an installed nail using a nail-gun is about 60% lower than the price of a hand-hammered nail--which suggests that the price of an installed nail is near its all-time low right now.